Does your cooling tower have a biofouling problem? 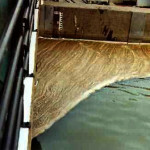 - AMSA, Inc.
AMSA, Inc.BlogDoes your cooling tower have a biofouling problem? Dirty foam containing deposits in cooling tower basin released after successful biofilm control program treatment. What’s growing in your tower? It’s important to be able to identify microbial biofouling in the industrial cooling systems that you treat. We know that biofouling is a bad thing … reducing the heat transfer performance of a cooling system, as well as causing microbially induced corrosion, harboring pathogens, and accumulating scale deposits. All these problems can lead to increased costs … and headaches for the water treater. But microbial biofouling, and its root cause, biofilm, may be hard to observe within the mostly hidden surfaces of a cooling system. A biofilm layer that is not even perceptible to the human eye can still significantly reduce heat transfer. After a biofilm control program treatment, you should also see an increase in suspended solids, ATP, and bacterial counts in the bulk water as deposits are released. After removal of the released deposits by filtration or blowdown, repeated treatment should show decreasing evidence of biofouling. AMSA’s BCP™ products, such as BCP 1015 (DTEA II™), are penetrating aids, dispersants, and cleaners, that when used with a biocide provide an effective biofilm control program. These common tests seem important to run for cooling towers. Running diagnostics for bacterial counts, indicating cultures, and deposit sample analysis would be necessary to make sure that everything is working in a cooling tower. I also liked that you mentioned to check on system performance. Making sure that they’re cooling efficiently and reducing heat transfer can help technicians know if repairs are needed.